My wife recently started a new venture as a business/life coach, so of course I volunteered to create her business cards. We wanted to make something that expressed her unique sense of style and set her apart from other people in the field. Casting herself as a 'professional muse' we decided to make a card that you could possibly imagine a magical creature of lore might actually hand you. 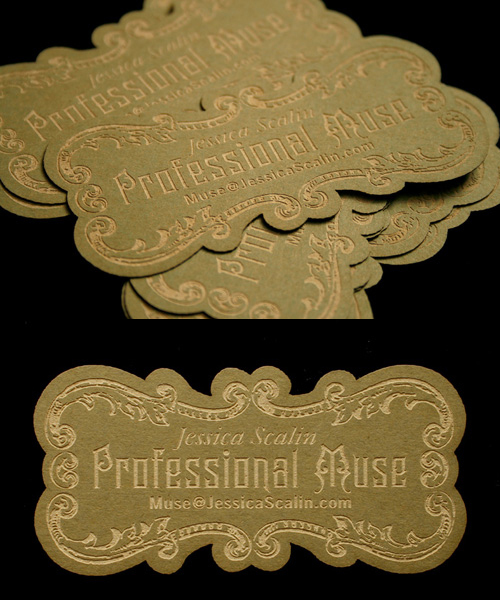 The card was laser etched/cut by the folks at BIG SECRET. There's no ink on it at all. What you're seeing is just the green color of the paper and the lighter color results from how it reacts to the laser.